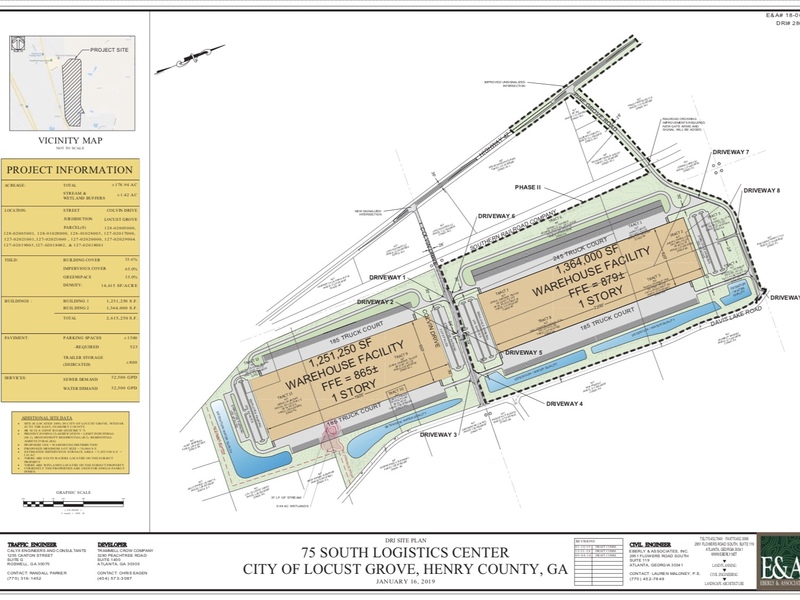 Additional information about the proposed 75 South Logistics Center, located on Colvin Drive in Locust Grove, is now available in new documents made available this week by the Atlanta Regional Commission. The ARC preliminary report and GRTA required traffic study are a continuation of DRI #2867 submitted in October. The 75 South Logistics Center proposes two warehouses totaling 2,615,250 square feet situated on 179 acres. The project is located east of Georgia 42 and the Norfolk Southern railroad, west of Davis Lake Road, bordered to the north by Pine Grove Road, and bisected by Colvin Drive. The 98 acres located north of Colvin Drive was the subject of a recent annexation approved by the city in December. The applicant plans on constructing the first building by 2021 with the full build-out completed in 2023. Land south of Colvin Drive, where the first building will be built, is partially zoned light manufacturing (M-1). A rezoning has been requested for properties located at 61 and 71 Jackson Street, presently zoned RA (residential agriculture), and a public hearing will be conducted before the city council at a future meeting. Land north of Colvin Drive is zoned RA. 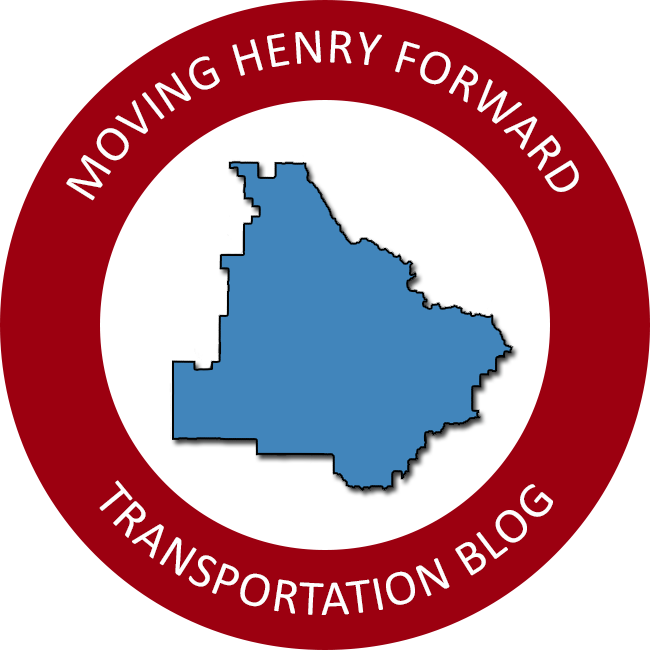 Land owners requested an industrial rezoning concurrent to the application for annexation; however, the Henry County Board of Commissioners objected to the proposed land use. The city annexed the properties with a residential zoning district and land owners may request a new rezoning in January 2020. Note: the full build-out values include the figures for phase I. The existing capacity analysis found that all intersections operate adequately during peak hours, except the eastbound approaches at Bethlehem Road and Marketplace Boulevard. This inefficiency was previously documented within traffic studies for the Gardner 42 and ClayCo projects. Locust Grove is planning to install a roundabout at SR 42 and Marketplace Blvd within the proposed SPLOST V program; however, an intersection improvement at Bethlehem Road is not expected until the future interstate exit is constructed starting in 2025. In future years, after calculating background growth and the project’s trip generation, the side street approaches at Colvin Drive and Pine Grove Road are expected to operate at level of service “F” during at least one peak hour of the day, the lowest rating available on the A-F scale. Traffic signals or modern single-lane roundabouts are proposed at each location to address the delays. The traffic study also mentions upgrading the local roadways to support the increased heavy freight traffic and implementing safety improvements at the railroad crossings. The traffic study collected vehicle counts on Thursday, February 15, 2018 for use in its projections. A 24-hour bidirectional count was collected on Georgia 42 near the subject property documenting 15,402 daily vehicles. Utilizing the DRI technical guidelines published by GRTA, highway 42 has a generalized capacity of 16,600 daily vehicles in order to function at an acceptable level of service “D”. Despite the present-day traffic volume occupying 93% of the available capacity, and the trip distribution assigning all vehicle trips to state route 42, the traffic study omits any recommendations regarding a potential widening of the highway to four lanes. A copy of the project’s traffic study is available on the Atlanta Regional Commission website. It is expected that ARC will publish its final report and conclude the DRI review in late February. Land to the east of the recently annexed 98 acres has requested annexation into Locust Grove. The three parcels total 84 acres.